No river pools are exactly alike, but with a systematic approach, you can get more fish out of all of them. Nearly 82 years ago, Ray Bergman examined the structure of pools in his book, Trout, and described a detailed strategy to fish them. Complete with illustrations, he retold his experience of sitting on a bank, while several different anglers approached and fished the pool, his concealed position overlooked. He observed each, noting their tactics and success. One particular angler fared better than the others because of his systematic approach— particularly in the way he identified the most likely trout lies. After picking these targets, he then took an angling position offering the best opportunity for a successful presentation. He even changed methods according to the different zones of the pool—fishing differently at the head, say, as opposed to the tailout of a pool. I find Bergman’s descriptions still relative and helpful today, and I agree with him that pools remain one of the most challenging parts of a stream to fish. A systematic strategy pays big dividends, however, especially if you’re willing to change or adapt as you go. But before you dive in, it helps to categorize pools by type— those found in high gradient (a steep pitch) mountain streams that flow over hard terrain are much different from those found in more alluvial (a valley floor with less gradient) sections of rivers flowing over a softer, more easily eroded substrate. Trout choose different feeding lies in different pool types and you’ll also need to fish them a bit differently by using multiple tactics to get the most out of them. Stream biologists use the terms “depositional habitat” to describe pools as opposed to “erosional habitats” like riffles and runs, but you can take it a step further in pools formed behind riffles and runs because they generally have a simple, three-part structure comprised of a head, body, and tailout. In an erosional habitat, the fast water scours sediment from the streambed and leaves behind coarse rubble too large to lift into the current, thereby creating the rocky, hard-bottomed streambed in a riffle. Carried through the riffle or run in the fast-flowing water, the sediment and fine gravel settle out in the pool as the water slows, giving it a softer bottom. While pools vary from as small as a bathtub to as big as a pond, those formed in high-mountain streams often trend to the smaller size. Also called riffle-run-pool streams, high mountain waterways follow a repeating pattern of riffle-runs that drain into pools. The water gains momentum in fast water riffles or runs, eventually scouring out a deep depression in the streambed that forms the pool, temporarily exhausting its energy in the process. At the end of the pool the water begins to accelerate again, gaining sufficient energy to form another riffle, thus the process begins again shortly downstream. The current not only lifts sediment to carry it through the erosive riffle-run, it also lifts food in the form of invertebrate organisms from the substrate. 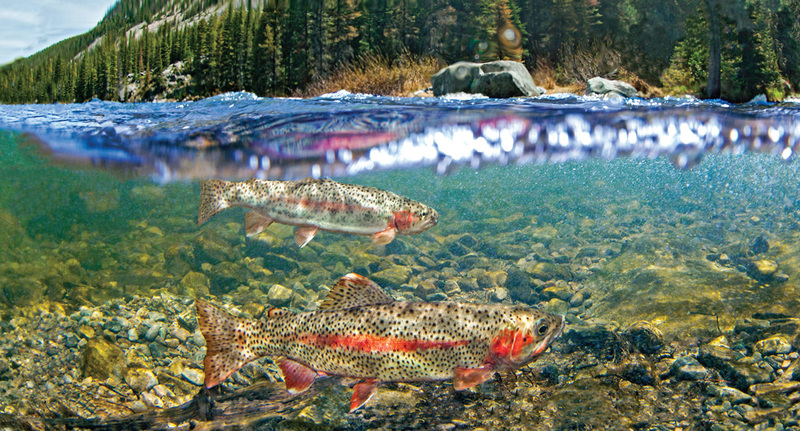 Food particles, carried through the fast water, settle out of the current in a pool’s head as the water slows, often ending up in the mouths of waiting trout. For this reason, I love to fish the head of mountain pools. Wherever you find a transitional zone between erosional and depositional habitats, especially one marked by a dramatic change in depth and current speed, you’ll find trout. The change in speed means food settles out of the current, and the change in depth means trout feast in lies protected from the current—behind the drop off—while the tongue of flow overhead drops food right on their plate. Anglers can imitate this sequence with nymphing techniques, but the same layer of fast water that serves as a conveyor belt of trout food also presents a challenge—your flies must pierce the layer of fast water to effectively target the trout beneath it. Tight line nymphing not only allows you to pierce the faster currents to keep your flies near the bottom, but by constantly adjusting the height of your rod tip through the drift, you can follow the contours of the streambed and stay in contact with your flies as the depth changes. From a position just below the pool’s head, cast your team of nymphs into the fast water just above the transitional zone (shallow to deep). Pause a brief moment to let it all sink before lifting your rod to regain contact, which is an important aspect of tight line nymphing. Then track your flies downstream, or even lead them gently. As you pass through the transitional zone, lower your rod as the water deepens to keep your flies in the strike zone near the bottom. Fish the entire width of the fast-water chuting through, but give extra attention to the lateral seams where flows slow, as these often offer prime lies to hungry trout. If possible, avoid floating strike indicators that suspend nymphs at a preset depth and prohibits the unrestricted liberty to keep flies near the bottom as depths change. Rather than targeting fish in deep feeding lies, the flies are trapped in the fast water that shoots over their heads. Dry flies also work well where fast flows drain into a pool. Drift your dry flies through the “fast lane” into the tailout as the water slows and deepens. Chose buoyant patterns that don’t sink in choppy water and high-stick your drift if need be to avoid the drag you’d otherwise get as your line crosses competing current zones. Be ready for strikes as the current slows. Hit the back eddies that often form to either side of the fast water. Following emergences and spinner falls, these backwash areas collect crippled emerges, drowned duns or sub-adults, and spent spinners. The trout will likely feed at a leisurely pace, so you’ll have to mend attentively to get a drag-free drift among all the various current reversals common in eddies. Pick a high rod position to elevate the line and reach over the far current seam and into the eddy beyond. The body of a pool presents challenges to anglers when it comes to reading water and identifying individual feeding lies. In the absence of well defined feeding lanes in slow moving water, trout relate more to structure. Large trout cruise back and forth looking for vulnerable prey on the move. In the body of the pool, bottom feeders like sculpins take advantage of the plethora of food along the substrate—the same invertebrates trout eat. Beginning from the same position you used to nymph fish at the head of a pool, work down through the body of the pool swinging and stripping a weighted sculpin streamer. Cast it across the pool and let it settle to the bottom, or even rest for a moment. Then lift the rod and pulse it gently like a natural fish swimming up in the water column to change its feeding location before dropping it to settle back on the bottom. Remember, sculpins lack the air sac/swim bladder of trout and most other fish species, so once one stops actively swimming, it plummets. With an effective presentation, you might just hook into a large trout using the pool as a home site and a place to find an easy meal. The tail of the pool is a transitional area where water begins to accelerate into the next stretch of fast water. Like a funnel, pool tails concentrate food both vertically and horizontally as the stream runs shallow and its width constricts everything into the following riffle. Standing above the bottom of a pool, try swinging wet flies or soft hackles through this transitional zone, twitching and pulsing them across the accelerating current. Or use small minnow-imitating streamers like a dace or other small prey fish species. Stripped in short bursts or under rapid rod pulses, this mimics a small prey fish trying to avoid being swept out of the pool as the current quickens.